November | 2014 | Frank & Donnis Travel Blog "the more we see the more there is to see"
On my walk this morning I encountered a snake on the roadway inside the village. From its size, colour and markings I believe it to be a Brown Tree Snake. This snake seemed to be well fed with a thicker body than I have encountered on tree snakes before. Although I believe it was a tree snake I should mention it is best to leave them alone. Most tree snakes are non- venomous but can bite. The BTS does have a mild venom and also launches into an S strike pose when threatened. As I said, leave them alone. After I installed a micro spray with timer watering system in my garden I have installed another two and been asked to install another two this week. I have carefully chosen the parts, particularly the timer so the price is acceptable. For about two hours work I charge $20. Depending on fittings I usually charge $55 to $60 for a fully operational watering system. Imagine my annoyance when today I went to a Bunnings store which carries all the items I need to find the timer and a Y piece are out of stock. Not just out of stock at my local store but out of stock at nearby stores as well. I can use another timer but that adds another $15 to the price. Later in the morning we met up with Merilyn from Melbourne who arrived on the Gold Coast over the weekend to visit with her son Greg. After coffee we took Merilyn shopping for a few essentials, such as tea, which Greg, being a busy bachelor does not keep in his unit. Then Merilyn and Donnis disappeared into Australia Fair Shopping Centre while I went back to the villa to install a couple of magnetic door stops, a soap dispenser and rubber non slip cups for the caster wheels on our bed. It has a habit of sliding on the new floor when we get in or out of bed. Merilyn called. She was at Harbourtown Shopping Town across the road from our village. We brought her back to the villa and prepared to leave for Broadbeach. Friend Glenda is having a break with her mum in a high rise holiday unit (it is owned by her brother) and invited us to a dinner. After a short walk on the beach we settled down for dinner. Painters had just finished painting the hallway around the lift foyer and outside Glenda’s unit. The paint was oil based. I do not handle oil based paint fumes all that well and could still smell the fumes inside the unit. By the time I had eaten a fume headache had a grip on me and was getting worse. After two Panadol I lay down on a bed and was asleep in minutes. So much for a pleasant night out! Another stinking hot day with high humidity. The type of day which encourages you to do nothing. Donnis is still unwell so we lazed around the villa all day. We spent most of the day emptying the back room and cleaning the walls and floor in preparation for??? The vague plan is to paint the walls and doors then lay the underlay and carpet we salvaged from the second bedroom when the bamboo floor was laid. Once it is looking tidy and clean we will most likely put in a small lounge which converts to a bed .Add a small second TV and use it as a guest room. We attended the monthly Fish n Chips night (we had burgers and chips tonight) along with a small bingo evening. We seem to enjoy these low level evenings with lots of laughs and good company. Some of the residents in the village have decorated their villa with Christmas lights. Compared to us (we have one small length of solar LED lights), their houses look like Chevy Chase house in the movie Christmas Vacation. Darn drat fizzle spit. I forgot my camera again. We drove from the Gold Coast to Redcliffe north of the Brisbane River and spent a productive time looking at items we want for the villa. More on that next week. Afterwards we drove to visit Peter at his new house. We spied his car going in the other direct ion as he was entering a roundabout while were exiting the same roundabout. There was no way we could turn around and chase him as we had no idea where he was headed. Instead we continued to his house and dropped off a few items and Christmas goodies. I hate shopping. Just ask Donnis. My idea of shopping is I know what I want and where to find it. Then I go and get it. Donnis idea of shopping is wander around and pick things up with no clear idea of what she wants. It can go on for hours. I get bored and frustrated. Today we went shopping, ostensibly for “D” rings to add curtain wands to the new curtains. That was just an excuse to wander around and feel things and say how nice they would look etc etc etc. Wow! Thank goodness I take my Kindle with me and can find a comfortable chair. Donnis was offered a nursing position at Lightning Ridge Hospital for two months commencing 8th December. We will not know if she has the job until Monday as other people may have applied as well. Lightning Ridge is about 100 Klms from Collarenebi where she spent Christmas last year. We know the area and Donnis is already on the NSW Health payroll system and has references from two local hospitals in that area last year and this year. Stay tuned as we will know more of what we are doing by then. The plans we made prior to this weekend may have to be changed. Expect some dramatic changes by next week. It was heat wave conditions here today so we went to Australia Fair Shopping Centre. We have never been here before and it was interesting wandering around the mall aisles which ran in different directions. We lunched at a Chinese Restaurant overlooking Southport Parkland s and the Broadwater. After lunch I looked at…drum roll… a bidet! Yep! A bidet. Why? Simply because there was a shop selling all different models and it was interesting. Nearing the end of the day Donnis mentioned she was not feeling well and in fact thought she had bronchitis. What the! So sick so quickly without any prior symptoms? The floor guys arrived at 6.30 am ready for a 7am start. They were a bit miffed that our local by-laws forbid power tools before 8am but there was plenty of preparation work to be carried out. The old carpet, which I liken to pale Arnotts Lattice Biscuits but for our overseas visitors if you can imagine waffle style carpet in a pale beige colour. Double click on the photo to view the waffle like carpet. 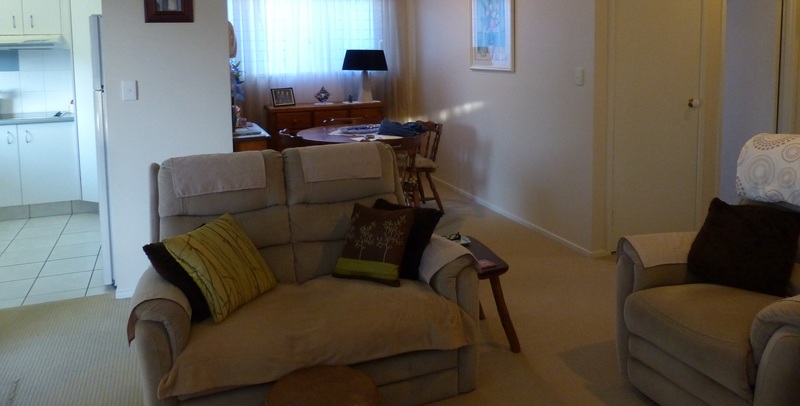 The carpet was old, stained and with flat spots where previous furniture was placed. It was time for it to go. Donnis suffers from allergies and dust allergies in carpet gives her sneezing fits. RALLYE was booked in for a 320,000 Klm service so we delivered it to Helensvale and returned to the village and set up our recliner chairs in the shade of the gazebo beside the creek. It was a hot day but in the shade with a cool breeze from the ocean blowing in along the creek it was a relaxing spot to spend our day. Late in the afternoon we went to collect RALLYE. The mechanic had called mid- morning to ask when the timing belt was last replaced as they should be replaced every 100,000 Klms Umm Err I recall when it was first replaced at 100,000 Klms and I had baulked at the cost but was convinced it was necessary. I do not recall replacing it at 200,000 or 300,000 Klms. So I said Ok go ahead and replace it and all the seals as RALLYE has been leaking oil for most of the year. An oil leak in RALLYE was unheard of in the past. The mechanic told me he could not believe the timing belt had lasted this long as it was severely perished and should have broken a long time ago. If it had broken the engine would have seized and require a total replacement. A storm arrived at the same time we did. The temperature dropped, the day darkened, rain fell along with lightning flashes and the wind changed direction and cooled the day considerably. To be safe I placed a flattened cardboard box under RALLYE when I parked it on the driveway. After the flooring guys had gone for the day we returned all the furniture plus furniture from the two bedrooms which will have flooring laid tomorrow. The flooring guys had promised to arrive early again so Donnis and I moved the bed and bedroom suite into the lounge room. We left the villa so the guys had a clear work space. I spent most of the day in the shade of the gazebo while Donnis attended her Tai Chi session followed by her swim in the pool. I checked RALLYE for oil leaks. NONE! So far, so good. The flooring is finished and looks good. Now we have to return all the furniture to where it belongs. 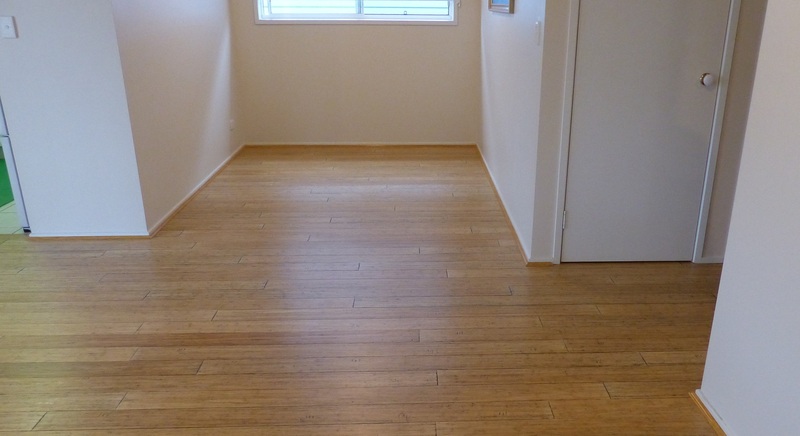 Our new “Bondi” Bamboo floor looking from front door. New floor seen from lounge room looking to dining alcove. Donnis health had taken a turn for the worse during the afternoon. Perhaps she should not have gone for the swim. Checked RALLYE. No oil leaks. On my usual walk this morning I noticed a young Magpie with a wing caught in fresh Golden Cane fronds. I approached to help but being a bit wary of that sharp beak realised not only would the birds struggles make its entrapment worse but in its panic would strike at me. I approached from behind and grabbed the bird and tried to lift it up the fronds. In its panic it did try to skewer me as well as letting out a series of screeches. Uh Oh. A cranky mum was nearby and dive bombed me striking me in the head. It then turned mid -air ready for its next bombing run. I managed to lift the young bird further up the fronds before mum struck again I then grabbed the fronds and spread them. The bird dropped to the ground squawking and flapping and striking at my feet as mum ran another bombing raid. The youngster with all its flapping managed to get airborne and it and mum flew off together. Donnis stayed in bed as she had a bad night with congestion and coughing. I moved things around and started preparing the garage to move shelving from the spare room. Once the spare room is empty I will put down underlay and a good piece of carpet salvaged from the second bedroom. We have been eating lettuce and radish and basil I planted not long after we arrived here. The tomato plants are now almost a metre tall and beginning to show flower buds. Several bean plants are competing with the tomatoes. We should have a crop by Christmas. Donnis was beginning to feel better but we both feel a bit cooped up after the floor was laid and we are re-arranging furniture. 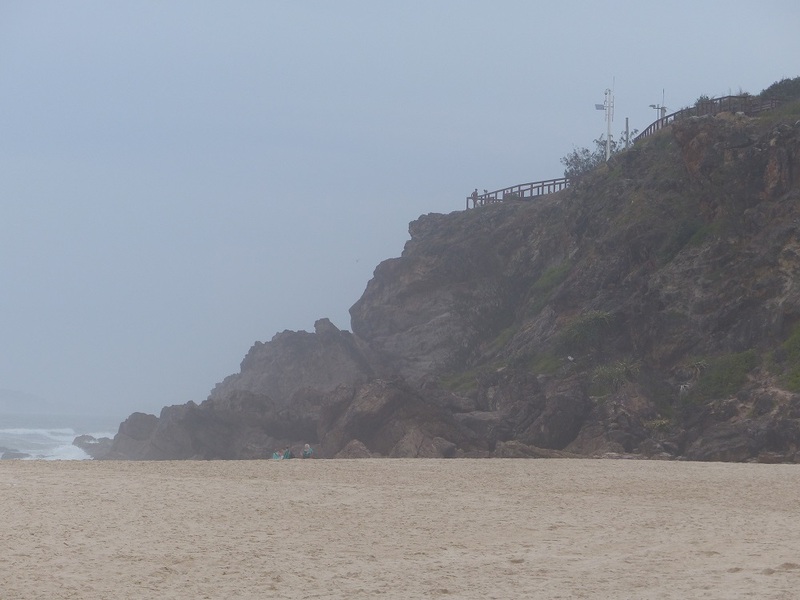 In the afternoon we drove to Nobby’s Beach. We had to drive through Surfers Paradise and it was something to see. Yesterday about 25,000 final high school students descend on the party capital to get drunk and let their hair down. Or is that let their hair down and get drunk? This is what is known as Schoolies Week. We saw young people draped over the footpaths and even two boys too drunk to walk but being supported by a shopping trolley. The afternoon breeze was blowing salt laden air across the beach giving it a foggy look. It was good to get out of the house just for a few hours. 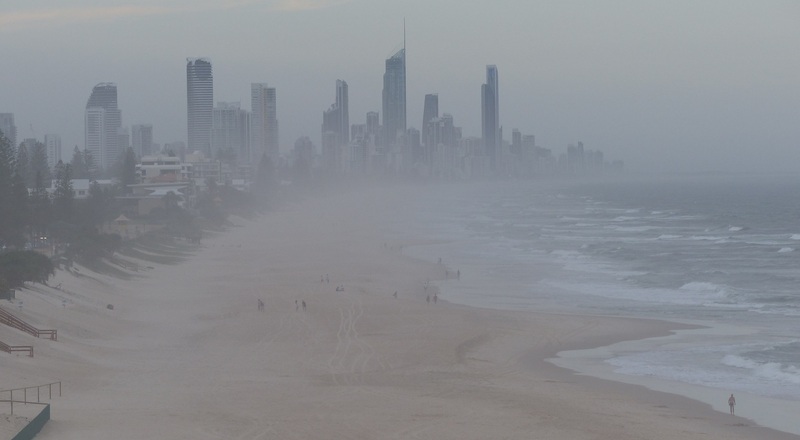 Surfers Paradise seen through the mist from the top of the headland at Nobby’s Beach. Checked RALLYE. There is an oil leak. It has been a long time since I had a pub crawl. ( Actually at post 372 in early May 2014 – 6 months ago) Since moving to the Gold Coast we have been busy doing umm err hmmm, I’m not sure. Whatever we have been doing it has kept us busy. Yesterday I pulled a muscle in my back and the pain is restricting what I can do. So I am resting. It was while in a state of rest I recalled all the photos taken of hotels over the last five or six years. 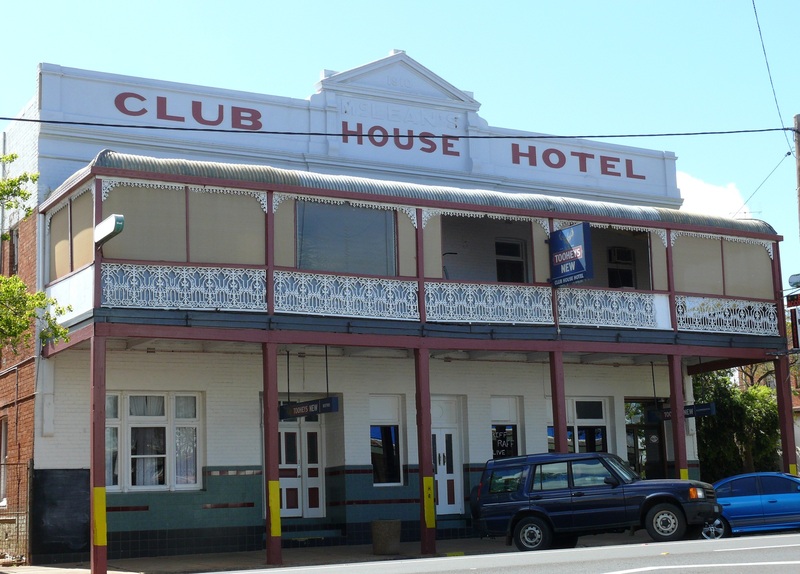 There are not many old hotels in the Gold Coast itself but there are many hotels in the hinterland and over the border in NSW. Lots of exploring to do. In October 2012 I drove in WWWGO towing TERIOS, from Mt. Beauty in Victoria to Guyrah northern NSW. I took a month for the trip and stopped for several days in many of the south central western area of NSW. Many of the towns were a sad sight in various stages of decline. Many of these towns were dependent on a particular crop or industry along with the railway. Once the railway was closed, those towns on the line started the slow decline. Some have somehow managed to re-invent themselves and diversified their base industries and are in a healthy condition, even prospering. Other towns remain neutral and are neither growing or declining. I was sad to see those towns which are in decline and when the pub is closed and begins to look abandoned you can be sure the rest of the town is faring just as badly. During the month of October 2012 I travelled from Mt.Beauty in Victoria to Guyrah NSW a distance of roughly 1,000 Klms. Taking my time to travel a relatively short distance gave me the opportunity to stay in some small towns. Coolamon was atypical in that it was surviving. Not growing but by the same token not dying. Coolamon NSW. The town tries to attract visitors by events such as the Scarecrow Festival in October each year. Part of the reason this town still survives is the train line is still active although a passenger train stops here twice a week. Once on it’s way west and once on the return journey to the east. Another of the small towns in my month long trip in October 2012. This town was in better shape than most and was probably still growing. The growth no doubt due to a varied industry base. It was not dependent on a single industry. 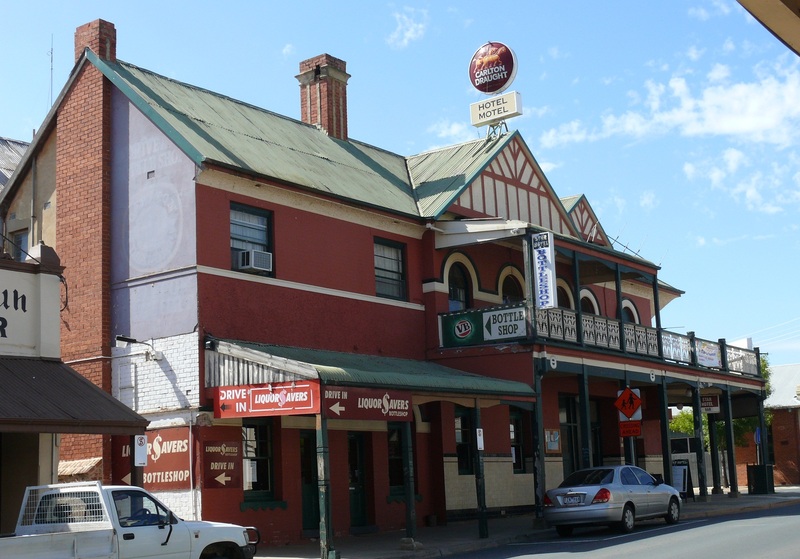 The Globe Hotel at West Wyalong NSW. This is a busy town which has a strange dog leg main street. You cannot see from one end to the other. First a few hundred metres, a bend another few hundred metres followed by another bend. The Globe Hotel is built on one of the bends. This hotel at Gainman in NSW was closed and had been for some time. Broken windows and signs and everywhere a patina of dust and desolation. The town itself fared no better. Sadly the town was in decline. An indicator is the railway no longer comes to this town. The Farmers Hotel at Gainman NSW was probably the saddest town I visited. The hotel looks active from a distance but once up close the broken windows and signs and rusted metal and rotted wood and a layer of dust over everything tells another story. The railway station or rather where the railway station once stood (there is now just a plaque to show where the station once stood – even the lines have been removed) is across the street. The Club House Hotel at Peak Hill. This is another town on my month long wander in October 2012. The Club House Hotel at Peak Hill is in a town which is obviously struggling. A nearby gold mine is a tourist attraction but on the day of my visit I only saw another couple while walking around the mine “pit”. Even then I gave up the self guided tour as the temperature was in the low 30’s and I did not feel comfortable walking around alone in the heat with nobody to know where I was . The other couple left after a few minutes in the heat. 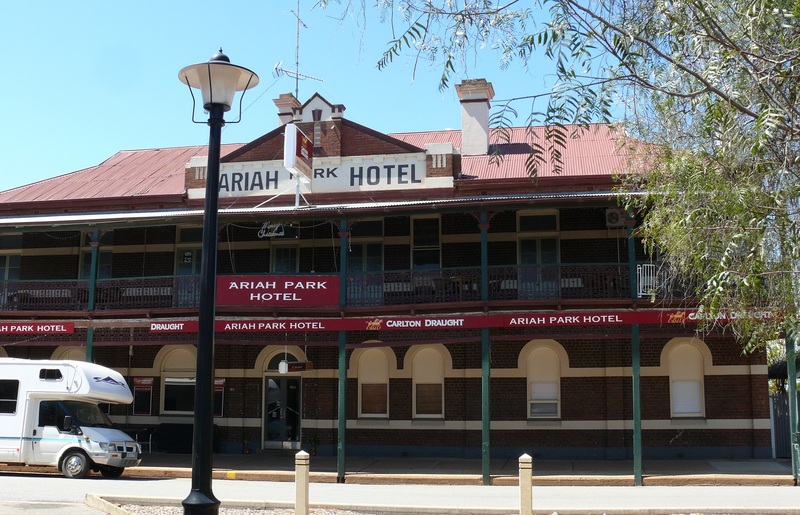 Ariah Park Hotel located at, of all places, Ariah Park in NSW. Ariah Park Hotel, Ariah Park NSW (it is pronounced Area Park). Most of the shops were closed and had been for some time. The dust on the display windows announced it has been a long time since anybody had been in the shops. The pub was about the only business, apart from the bowls club which had customers. 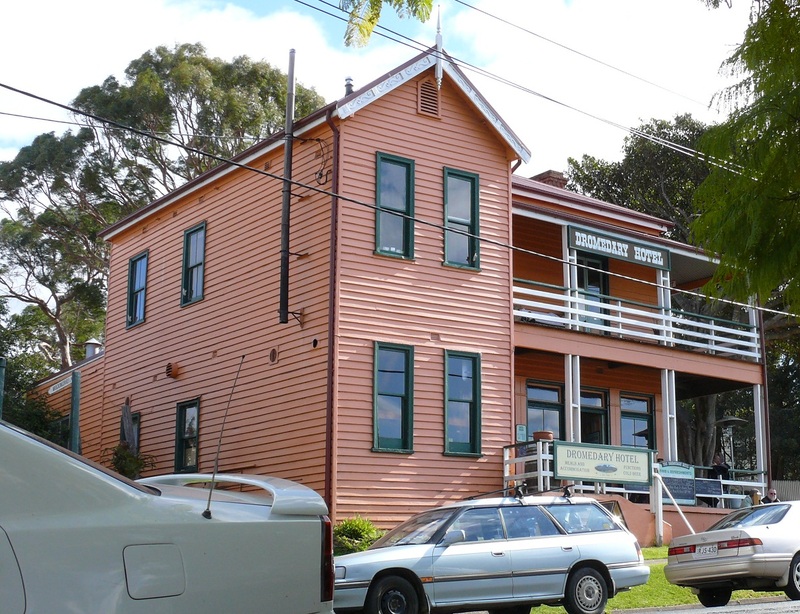 This pub at Ardlethan NSW started life as a …coffee house. October 2012. The Palace Hotel at Ardlethan NSW. It is the Ariah Park Shire. This town is, like AP trying to attract motorhome/caravan visitors to town by providing cheap camping facilities. This hotel was once a thriving coffee house built when the town, like AP was under the control of teetotallers. This town like AP was known as the towns of Wowsers and Bowsers. 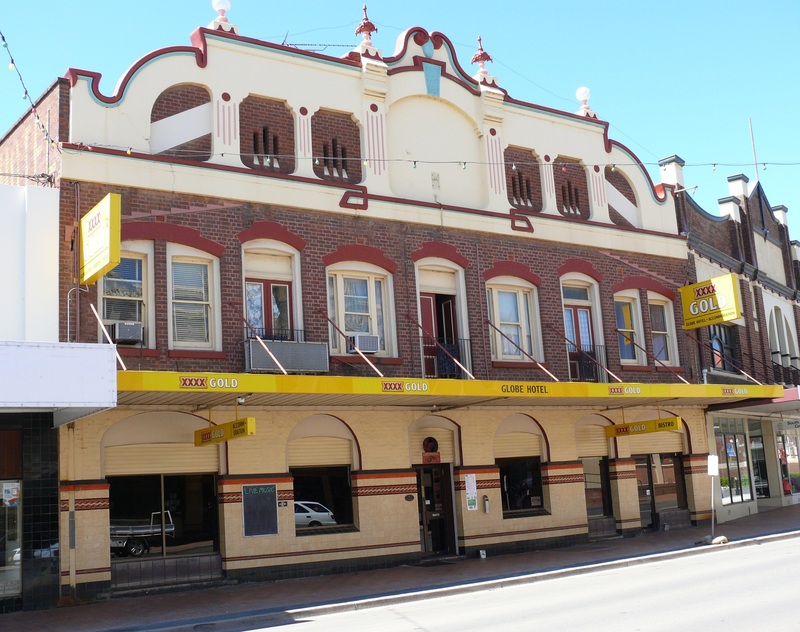 Star Hotel, Rutherglen Vic. Rutherglen is now more noted for lots of wineries and wonderful wine producing area. Of particular note is the excellent Port Wines. When we stayed in the small town of Culcairn south west NSW in 2012 we visited many towns in the area especially those along the Murray River. Rutherglen although well endowed with pubs is now better known for food and wine tours. Every second establishment caters for special food menus. Even the pubs stock a good range of quality wines in their upmarket dining rooms. The town is well known for the fine fortified wines – Ports – from the vineyards in the region. Donnis worked at the Henty Hospital for three months in early 2012. 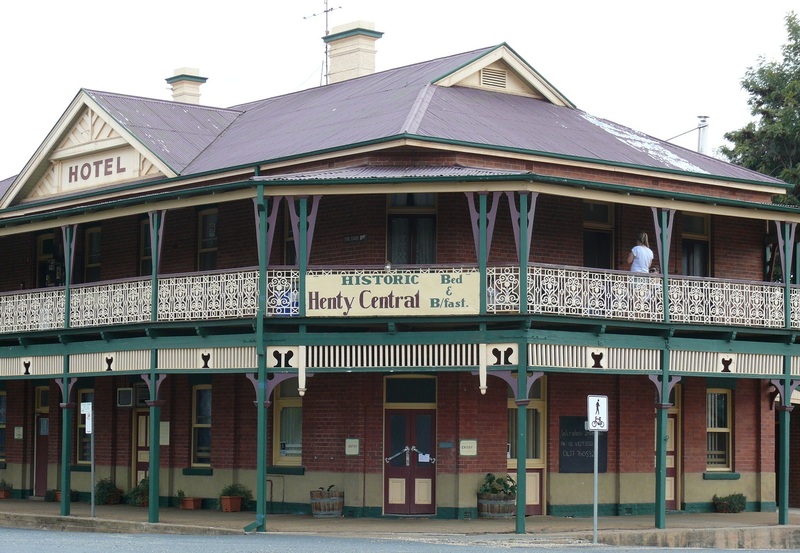 Henty was well endowed with hotels and this one, the Historic Henty Hotel still had horse stable out the back. Hebel Hotel Qld just near the border with NSW. The Dromedary Hotel in the small south coast of NSW town of Central Tilba. Hmmm! Or is it Tilba, itself or maybe even Tilba Tilba. We visited the collection of small towns/villages of Tilba in 2013. 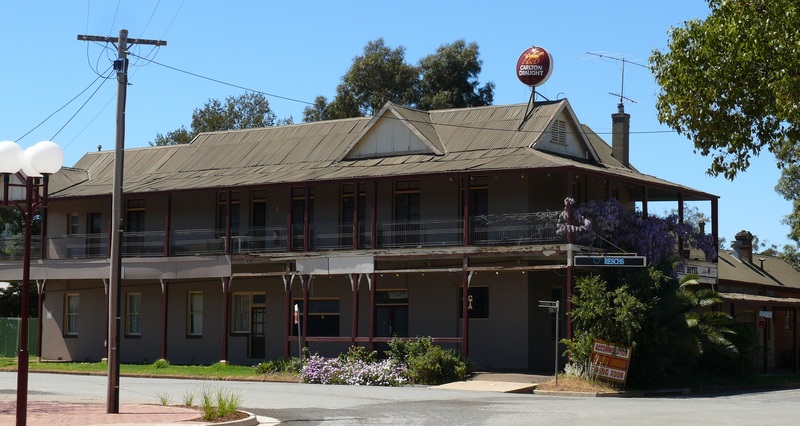 This old timber hotel is called the dromedary ( many think it was named after a camel which carries its drinking supplies on a hump on its back and the local sheep shearers carries all their worldly possessions, including water in their “bluey” which was a rolled up set of blankets, on their backs. Travelling shearers liked to spend time drinking at the local pub. In fact a nearby mountain is called Dromedary and that is what the hotel is named after. We packed some items we had stored for Peter and drove them in RALLYE to his new house. Day one of three days of predicted heat wave conditions. Last night we had put together a loose set of options of what to do to remain cool. Most of those options centred around staying put in the village. We have not yet insulated the ceiling cavity of our villa but that is on the long list of things we need to do before summer. Gulp! Three days of heat wave and summer is not here yet! Actually at the end of the day the day was not too hot. Day two of the heat wave and today we felt the heat. By mid- morning it was obvious the usual sea breeze was missing. Instead we got a hot north westerly blustery wind straight out of the dry and hot hot hot interior. The temp peaked at 35 degrees. In the morning, village resident Des, the man who runs a men’s shed called the Toy Boys asked me to join him when he took some toys to a Rotary Club Project known as Surfers Sunrise Wheelchair Project. ( http://www.rotarysurferssunrise.org/wheeelChair.php ) I was given a guided tour by Daryl S while Des delivered toys and collected re-cycled materials to make more toys. While on my tour a lady arrived with a plastic bag containing a few toys and lots of shampoo bottles. All will be included as a gift in each wheelchair shipped overseas. This group of dedicated men build wheelchairs from old bicycles. They can make a chair for less than $100. In the 17 years of their existence they have built and exported almost 6,300 wheelchairs to needy recipients in developing countries. Each box contains a wheelchair and a little gift. The men either make the component parts and assemble them at their huge shed or they ship the parts to a local prison or a Work for the Dole Group who then assemble the parts into a complete wheelchair. Those groups return the completed chairs to be shipped overseas. As part of the project of re-using as much re-cycled materials as possible they collect all aluminium and sell it. The funds raised as well as other funds from Rotary has enabled them to make a medical centre, a safe house and a school in developing island nation places ravaged by natural disasters. The heat was a good excuse to close the doors and windows, turn on the air conditioning and watch all the G20 overseas dignatories arrive and go about the business of why they were here. Of particular interest was the speech given by Barak Obama at University of Queensland. In the afternoon we joined several other residents cooling off in the pool. The heat wave conditions continue. In the morning I reached through the passenger window of RALLYE and pulled a muscle in my back. I had severe pain for the rest of the day. For much of the day we turned on the AC and vegged out. Except that is when we went for a swim. Another ten residents had the same idea. Next week we have a few things happening and building up to our next adventure. Our village social committee organised a Melbourne Cup luncheon with sweeps, raffles, fashion parades, mock horse races and lots of bonhomie. Normally on Melbourne Cup Day I enter several sweeps just to be a part of the atmosphere. Of course we never win anything. This year we entered 6 sweeps and ended up winning or placing second in three of them. We also won a prize for a last placed horse. Of course our winnings are not enough to buy a new car. Our winnings were enough to cover the cost of our meal and the price of the sweep tickets. On a sad note, the favourite horse to win the cup placed last and a few minutes after the race collapsed in its stall and died. Another horse in the after race parade was spooked by a child waving an Aussie flag and reared up then kicked with its rear leg. The leg became entangled in fencing and further kicking resulted in a broken leg and other injuries. Those injuries were so bad the horse was put down. The Melbourne Cup has been an annual event and one I recall even as a child. I can never recall when horses died in this event. To have two horses die in one event, especially horses worth millions of dollars is very sad. Next to our village is a huge plot of level ground with much of it having canal frontage. It is prime residential land. Other villa owners and we, understood the local house zoning was for a maximum of three stories to be built. We were all unaware the zoning was changed to 12 stories. A sign was erected last week to show a new development on the land of eight high rise buildings of 18 stories! Naturally the residents here object to the proposed development on several grounds. We have all written objections and placed them with council. Several nearby resident action groups have joined us and had a meeting with us yesterday. A plan of strategy is being drawn up. First is to bring public awareness. A local TV news crew arrived today and interviewed several of our residents. We all know we cannot stop the development but hope that with our objections we can delay or modify the buildings particularly in relation to height. It could be a year or two before any approval is issued and work begins. My sister Bev and hubby Peter called in for a visit. They were in Brisbane last night for a graduation dinner for son Mitch. We picked them up from the railway station and had a picnic lunch in the gazebo beside Biggera Creek. After lunch we had a drive to The Broadwater, Surfers Paradise and The Spit. After coffee we drove them to Coolangatta Airport for their flight home to Sydney while Donnis and I drove the slow way home along the coast road. Yahoo! Donnis son finally got the keys to his new house. We took the opportunity to load up RALLYE with some of the bits n pieces we have stored and delivered them to the new house. That was our exciting day. Usually, I do not like to forecast our plans for the coming week. Or weeks. Today I will make an exception. We are planning our new adventure to commence in a couple of weeks The travel should take us through four states. Stay tuned. Frank spent the morning in court in Armidale. After all, that was the reason I went there. The judge decided, after hearing the prosecutor from the Dept of Public Prosecutions was ill and could not attend and a replacement could not be found at short notice, to defer proceedings He set a date for 19th November for the two parties (prosecution and defence) to meet in his chambers to decide on a date to recommence proceedings. What the!!! A date has been set to decide on a date to be set! In the meantime I travelled for seven hours to appear as a witness and will have to wait until another date is set to appear for a third time! I met with the barrister in the morning and went over details of what my witness information will be. I then drove the seven hours back to the Gold Coast. A Potential Buyer for WWWGO arrived from Adelaide and met with Donnis. I arrived home a few hours later. He stayed the night. After we all had breakfast at the Tartare Restaurant I took the Potential Buyer for a test drive and showed him all the working parts of WWWGO. Later he took us for lunch at a seafood place on the Broadwater. I drove our PB to the Coolangatta Airport for his flight home while Donnis attended a Tai Chi class. Tonight, while watching TV we heard two loud thumps on the wall outside the dining room window. I got a torch and shoes and went outside to investigate. Hmmm! A plant stand had been moved from the garden to under the window and a wheelie bin had been moved away from the window to make room for the plant stand. The plant stand had collapsed and fallen against the wall. Most likely from the weight of a person. We have had an intruder!!! A prowler!!! A burglar casing the premises!!! I walked two houses away to speak with the Home Owners Committee chairman. He was away but after I explained to his wife Julie what had happened she called security from the van park next door. Soon we had two men patrolling the streets. They also mentioned an intruder had been reported in the van park an hour before and they had a good description of the alleged perpetrator and this was passed to the Police. I joined the security guy in checking the fence line. Near the creek I was about to step on some rocks but decided to shine a torch on where I was about to step. Good thing I did as I almost trod on a snake. Although a Google search later showed it to be a non- venomous Childrens Python I am sure if I had trodden on the snake it would not have been happy and would have reacted. In turn I would not have been happy either. Once upon a time I would have said this date was only of significance to people from the Northern Hemisphere and perhaps a little deficient in grey matter. I speak of course of Halloween. Somehow this madness, a leftover from less enlightened, pagan times, has somehow invaded the land of Oz and confirming we are just as basically superstitious and fond of scaring small children as anybody else on the planet. By breakfast the events of last night were beginning to be a topic of interest and several people dropped by for my first- hand account. It seems apart from causing some trouble in the van park next door our intruder/prowler / burglar had been busy in our village as well. Several people started reporting things that went bump in the night and lawn shed doors being opened, even a stolen electric outboard motor. The burglar had raised the motor onto a wall next to the village post boxes. Our sharp eyed security staff and or Police noticed it. They waited. The thief returned to collect his booty and was himself collected as booty. The Police called around to see me and gather more information. Luckily by this time I knew who had his electric outboard stolen and was able to pass on his details. He had his outboard returned by lunchtime. He now has a padlock on his garden shed. I installed a micro spray watering system in our neighbours garden. They are still away but as a thank you for allowing us to store WWWGO in their space I installed the timer sprinkler system. Another neighbor suggested I may be interested in installing them for other residents as well. For a fee of course. Tonight was Fish n Chips night at the clubhouse. Afterwards we played $1 bingo. We sat opposite several older ladies who were a hoot. They were all quick witted and knew how to stir the caller to the point he was intimidated or exasperated, perhaps both. They all had a good laugh. All night – well until at least 8pm when some folks begin to get tired. We drove to visit Robyn who had allowed us to park WWWGO on her property for a couple of weeks last month. Her twin sister was visiting as well. Robyn and husband Brian worked in the ski fields in the USA in the early years of this century – think about it. In the off season they felt the choice of eateries in the towns was a bit limited. Robyn & Brian, both chefs decided to start a new food shop called G’Day Mate, an Aussie Meat Pie and other Aussie baked treats. The first shop was such a success they started another two in neighbouring ski towns. The main reason Donnis wanted to visit was to spend some time with Robyn’s daughter in Law Louise who is visiting from Melbourne. Louise has two children. One is Poppy and is about the same age as granddaughter Hannah as Donnis is needing a grandchild fix. Donnis also got to cuddle the newest member of Louise family who is only a few weeks old. I was interested to renew acquaintance with Louise as she is a talented pilot married to another talented pilot, Rod. However Louise is the most famous, or infamous of the two. She is one of the few pilots who have flown under the Sydney Harbour Bridge. Which is naughty and illegal, I know, but she knew what she was doing and I respect her courage and talent. Rod flies supply planes to the Antarctic while Louise, when she completes her maternity leave will return to flying search and rescue planes. In the afternoon I finished a job started shortly after moving to the Gold Coast. We have an extendable dining table and eight chairs. The table and chairs are made of teak. They were made in 1972 by Parker Furniture and once belonged to my father. I inherited them on his death. Over the last few years while in storage, the teak oils have dried but the human oil from touching over many years has created a haven for mold to establish itself. The upholstery has lost its spring and the entire set looks tired. 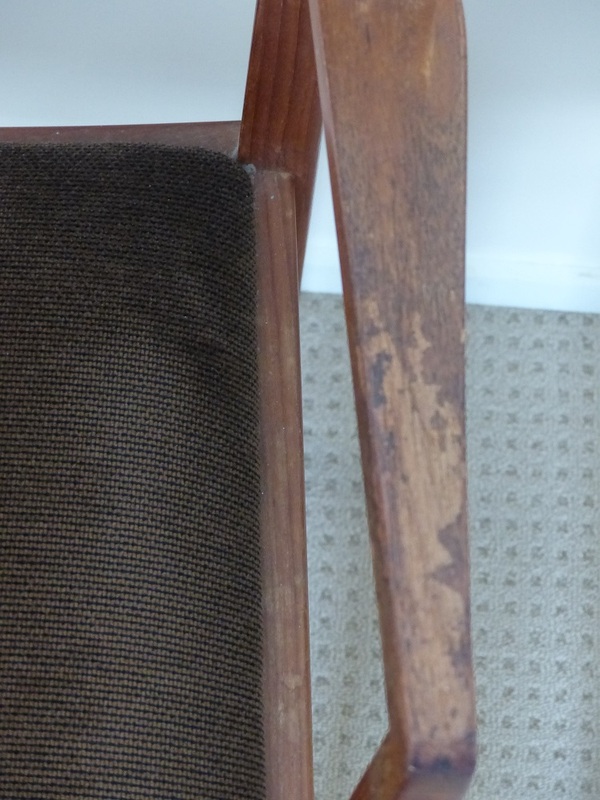 Look at the closeup of the timber arms on the chair. This was the typical condition of the eight chairs. I found a local well respected upholsterer to give new life to the seats. I agreed to take off the seats and back rests then clean the timber frames almost back to bare timber and once the chair is clean give it a coat of restorative oil. 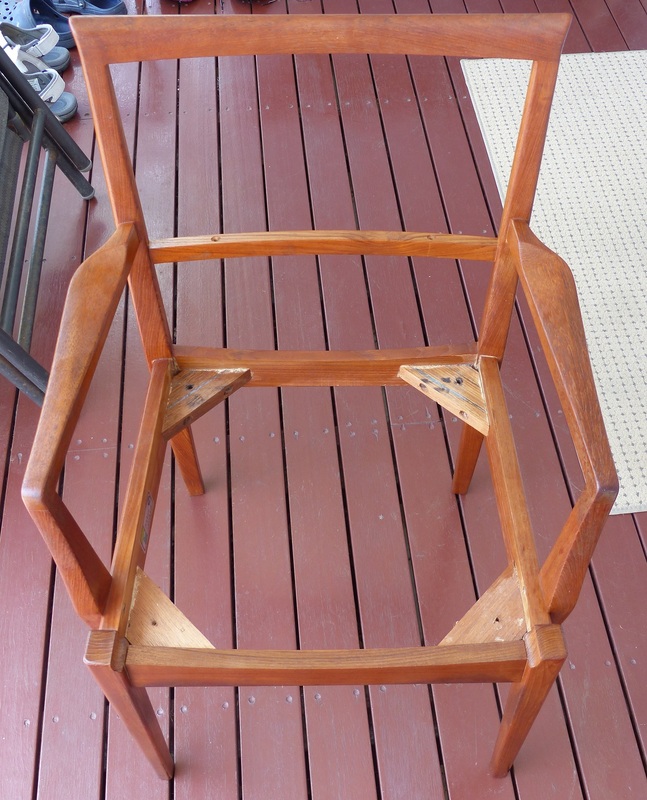 After spending a few hours each day per chair, the cleaning and restorative oil gave them an almost ne appearance. 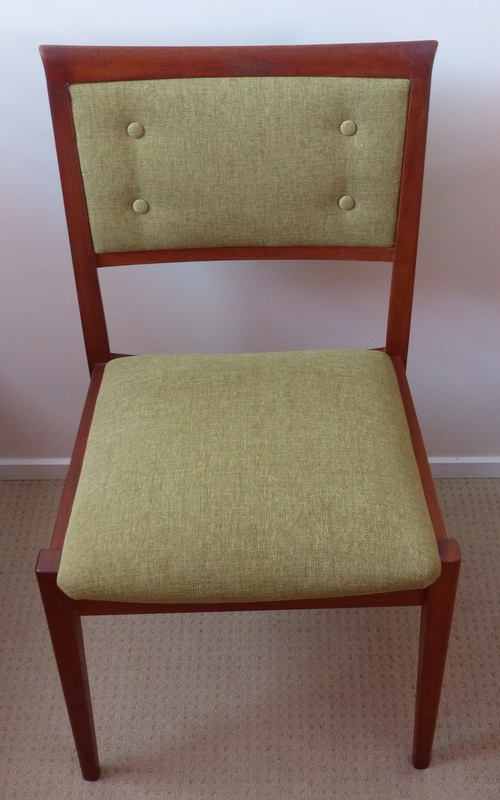 I finished four chairs and the upholsterer used the new Pistachio coloured material we chose to make the new seat cushion and back. As well the cushions were re-sprung and new padding added. Once he completed the first four chairs I started the cleaning work on the next four chairs. 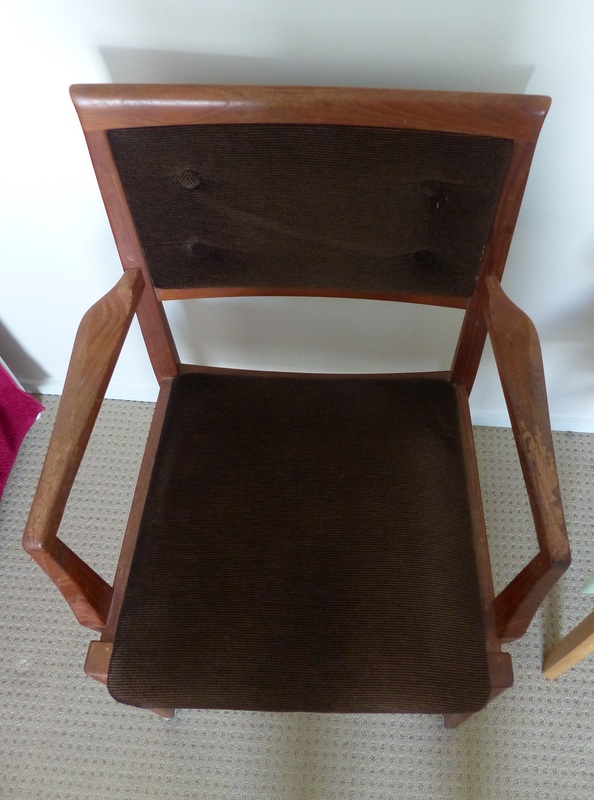 New upholstery and clean newly oiled teak frames and the chairs look wonderful. 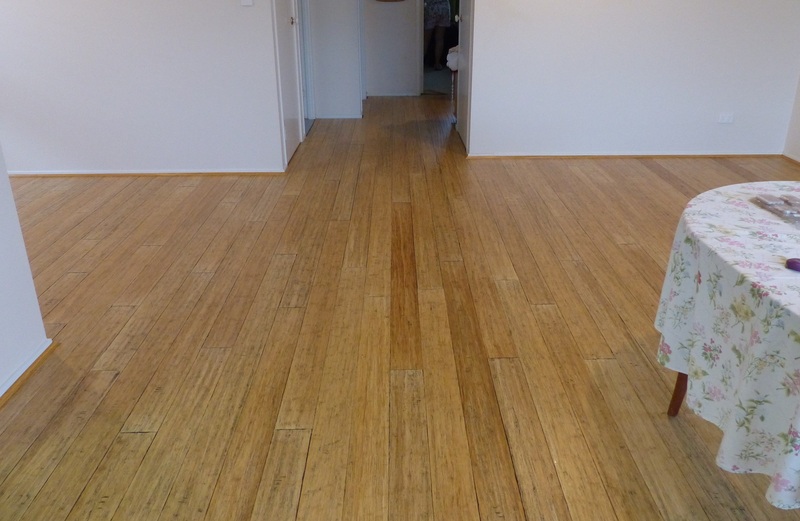 We are also having the carpet removed removed and replaced by a blonde coloured bamboo flooring. Tghe final job on the chairs will be to place felt slider tips on the cahir legs. The tips will protect the floor from any damage and allow the chairs to glide freely. I finished the final chair today and packed them all into TERIOS ready for delivery to the upholsterer on Monday. The next job is to restore the dining table which was slightly damaged by the same drying out and mold the chairs suffered plus damage by chairs stacked on it for 4 years. There are bush fires to the north and west of the Gold Coast. The smoke haze hung all over the area and combined with the overcast conditions indicated rain was on its way. Nope. Take away the smoke haze and the thin cloud cover was never going to bring rain. We had a lazy day around the house and after lunch visited Val and Sue R. While Val and I discussed dash camera’s and micro chip SD cards etc – a fascinating subject – Donnis and Sue swapped scrapbooking thoughts – another fascinating subject. We enjoyed our visit. The buzz around home is the Melbourne Cup luncheon on Tuesday. Donnis already has her outfit prepared and I am planning to dress up for the occasion – the first time ever.